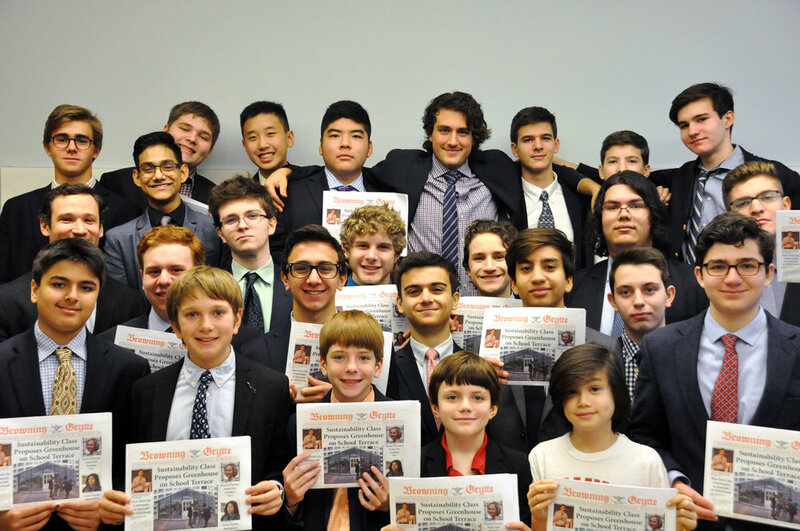 The Grytte newspaper staff was given a Gold Medalist rating by the Columbia Scholastic Press Association (CSPA) for the four issues they published in 2015-16. The Medalist Critiques are the written evaluation of the publication compared against a set of printed criteria as completed by CSPA judges. Click here to learn more about the Grytte’s trip to the CPSA fall conference. The third and fourth grade boys helped make the return of Panther Game Days a success in contests against Loyola on January 5. The boys, along with parents and faculty, were happy to show off their pride and had a great time! In preparation for their upcoming unit on Japan, the third grade boys visited the UN as part of their social studies curriculum on world culture. The two sections of the Intro to Engineering class competed in a robotics competition as a culminating activity for their engineering design project. Each student designed a robot then selected the best design to build, program, test and improve their robots in order to compete against the other section of the class. The winner of that match then went on to compete against the Advanced Robotics team. Watch a livestream of the event here. The Advanced Robotics team will compete at Dalton next month in a NYC regional competition for the First Tech Challenge. The fourth graders presented their social studies projects on January 12 based on American colonial resistance, including protesting the Stamp Act, Sugar Act and the Townshend Act.